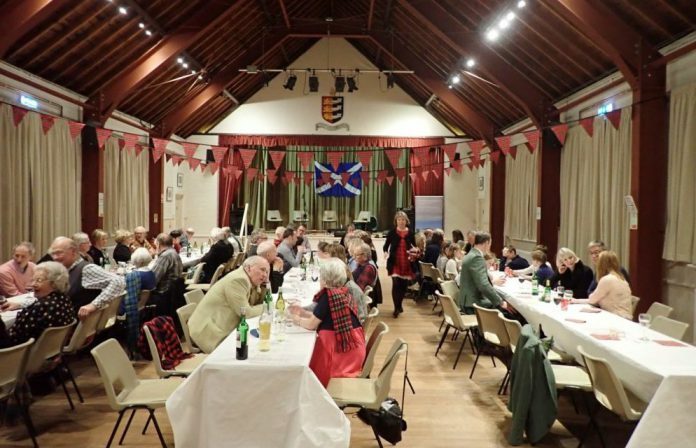 Sussex Wildlife Trust and the friends of Winchelsea Guy Fawkes Society joined forces at the weekend (Saturday, January 26) to stage a fantastic Burns Night supper and ceilidh in aid of the Rye Harbour Discovery Centre appeal. Guests enjoyed the Burns Night Address to a Haggis delivered by Derek Rankin, director of RX Architects. They were then served a delicious Burns Night supper of haggis, neeps and tatties, followed by cranachan (a dessert made with oats, cream, whisky and raspberries). The Black Cat Ceilidh Band provided music for traditional dancing. In addition to having a great time, the guests raised £700 for the Rye Harbour Discovery Centre appeal. The appeal is seeking to raise £500,000 towards a purpose-built Discovery Centre, due to be completed by December 2019. The centre will act as a focal point for visitors to the reserve as well as hosting school visits. The Friends of Rye Harbour Nature Reserve is a charity whose 2,000 members support the nature reserve’s work through subscriptions and volunteering. Since 1973, it has part-funded the cost of staff, land purchase, large scale habitat creation, tools, vehicles and visitor facilities such as bird watching hides and information centres. It provides events for its members throughout the year and the Discovery Centre project is a joint venture between Sussex Wildlife Trust and the Friends of Rye Harbour Nature Reserve. Inspired by the potential it offers for the region, Pete Anderson, owner of Fletcher’s House tearoom in Rye, organised a Christmas raffle in aid of the new centre, raising a wonderful £572 in the process. You can donate online or text £5, £10, £15, £20 donation by phone. Text RYE ‘5’ to 70085 to give £5 plus your standard network rate.